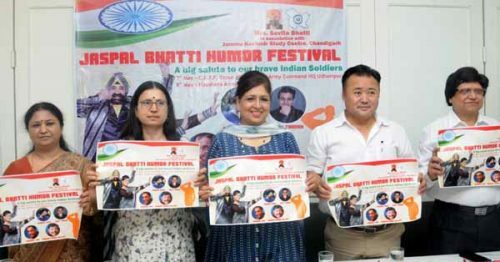 The Jaspal Bhatti Humor Festival, honoring the memory and vision of India’s greatest satirist, Mr Jaspal Bhatti is taking the second step of its journey by performing for the Indian troops stationed at the JAMMU, UDHAMPUR AND NOUSHERA (LoC). The festival initiated on Mr. Bhatti’s birthday on March 3rd this year had a super hit run at Chandigarh by showcasing superb performances by top names in English, Hindi and Punjabi comedy. Giving this information, Mrs Savita Bhatti said that this once in a lifetime opportunity of paying tribute to our brave soldiers was due to the initiative by the Jammu Kashmir Study Centre (Chandigarh Chapter), an NGO which has been doing exemplary work in the valley to tirelessly rehabilitate terrorism affected families and integrate peace loving sentiments in Jammu, Kashmir and Ladakh. The Humor festival will showcase the acts of famous stand up comedians Amit Tandon, Maheep Singh, Banwari Jhol and Pradeep Pallavi. The team will be performing for the CRPF in Jammu, The Indian Army at Udhampur and Rajouri ( Naushera) on 7th and 8th May 2016. “Mr Jaspal Bhatti always wanted to create a platform for humor and today with the number of comedy shows on the rise, it’s a tribute to the tireless work of Mr Bhatti. Like in Chandigarh our attempt is to showcase different talents in humor. Our soldiers live in very difficult circumstances. We cannot even imagine the loneliness of these people away from their families, fighting till the last breath for us. If through our efforts we can spread a smile on their faces, it would be the biggest reward of our lives,” she added. She applauded the artists for coming in for performing without charging anything. “It speaks volumes about the respect they have for our soldiers and for Mr Jaspal Bhatti. And we’re making sure in all the runs of the Humor fest that vulgarity in comedy be avoided at all costs”. Savita Bhatti added that it was an emotional moment for her to feel the spirit of her brave husband among the brave soldiers of our country. Being an Air Force officer’s daughter herself, she cannot feel greater pride than being with the soldiers. On this occasion,Mrs Savita Bhatti was present with Mr Vinod Sharma, and the JKSC members Prof Devinder Singh, Prof Renu Vig, Advocate Vivek Chauhan, Advocate Deepak Balyan, Shri Vijay Vaishnavi, and Shri Stanzin Dawa. Also present was a special invitee Shri Ravi Bharti Gupta, the relative of Capt Tushar Mahajaan, the braveheart of 9 Para who laid down his life for the Nation while fighting terrorists in the EDI building in the Pampore area of the Pulwama district in Kashmir Valley this year in February.